An apron, the area of asphalt where the driveway meets the road, is an important component of your driveway that conveys curb appeal to your guests while providing a durable fortification to the inevitable outside forces that your driveway may endure at one time or another. Without a doubt, aprons make the entrance to a home or business more attractive and that’s why we take the time and effort to provide the customer with an apron that is both structurally sound and visually appealing. 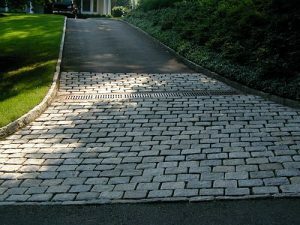 Driveway entrances frequently take lots of abuse from cars and trucks, plows and weather; however, with a firm and well constructed apron, there is an area of extra strength and reinforcement to your driveway that can prevent damage such as cracking and sinking. Every apron that we complete adds a beautiful feature to the home or business while protecting it and providing harmony to the overall look of your property. Contact George Hartshorn Paving for Customer Satisfaction and Quality you can drive on! Servicing: Putnam, Westchester, Dutchess Counties. We had our driveway paved and were very impressed with the quality of work and the time it took to complete. It was a pleasure doing business with George Hartshorn and we highly recommend this company. The team was neat, clean, quick, professional and did an overall excellent job doing our driveway. George Hartshorn Paving was the best experience I have had with a contractor. From beginning to end George and his crew were pleasant, professional, and easy to work with. The price quote was the best I received, they arrived on time as promised, they completed the work as promised. There were no surprised and George is the most straightforward and honest professional. Everything I have heard about Hartshorn Paving in the Putnam County Community is absolutely true!!! It was the best choice I could have made and I would highly recommend George Hartshorn Paving to anyone!!! Outstanding work. Far exceeded my expectations. George is a true craftsman. Absolutely the best! They did an amazing job on our driveway we couldn't be happier. Have used them twice in 10 years. Put simply, they are pros that really care. I had an old driveway that was cracking and had lots of bumps and swells. My driveway was in bad shape. I hired George, he immediately began by taking out the old driveway completely, put lots of gravel down, and then replaced my old driveway with an amazing new driveway lined with beautiful belgian blocks. Additionally, he put in a very elegant flagstone walkway in too. My whole property has been transformed form average to spectacular. I now have a stunning curb side appeal. I had heard from a few people that his work is outstanding and appropriately priced, and I have to say everything I heard was correct..!! If you're in the market for a new driveway or a patio or walkway, George is absolutely an amazing craftsman. Professional, clean, polite and honest. Thank you George !! My experience with George Hartshorn Paving was excellent from the time George came to give an estimate to when his employees came to pave my driveway. I can honestly say I received great service and a great price for the paving work done. I would recommend their services to everyone. George Hartshorn Paving is a local family owned business that stands behind its work and is very active in the community. George Hartshorn Paving has helped us with projects around our home and we are extremely satisfied with the work that was done. We recommend calling him for an estimate. You won't be disappointed. I recently had work done by George Hartshorn Paving. Before selecting this company I was searching around for a paving company. I chose to go this George Hartshorn Paving because of how they presented their plan to execute the job. They stood by their quality of work and it was worth all the money I spent. George was present the entire time and he was a pleasure to deal with. I would most definitely recommend them to anyone who is looking for a great quality paving company!